On Wednesday afternoon, we decided we'd go up to campus to start walking around and getting a feel for things. I was immediately intimidated by the parking situation, feeling like there was no way I could find a spot, then find my way around campus, and finally find my car again at the end. Education Week was going on at BYU, so it was especially crowded. But we lucked out after almost an hour of searching and parked the car. Then what? I mean, where to start? I had only been on the campus one time before, about 15 years ago when I came to visit a friend, so I had no idea. I tried to play it cool so that my daughter's anxiety didn't rise to uncontrollable levels. The thing about BYU is that everyone is so kind. People stopped to help us just because we looked completely bewildered. People offered to walk us to different buildings, to share with us their experience on campus (for one man, there for Education Week, it was 40 years ago! ), to give us advice and mostly pass on excitement to Lyndsay about what a great time she will have. There's the famous "Y" on the mountain. Lyndsay will be hiking to that later this week. We found the Creamery right away (actually, before we found a parking spot) and had to go in for ice cream cones and to scope the place out. Once we were officially on the campus, we just started locating buildings, trying to orient ourselves. 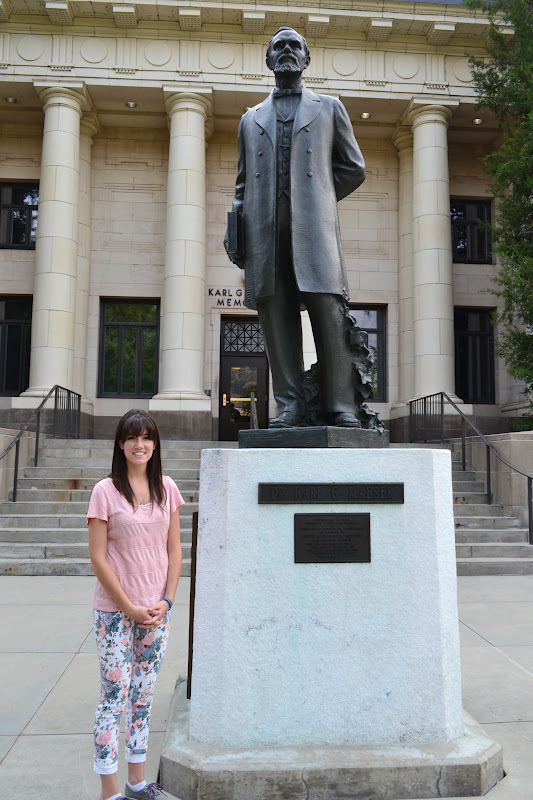 Here's Lyndsay standing in front of the Brigham Young statue, which stands in front of the Abraham Smoot Building, an administrative building. 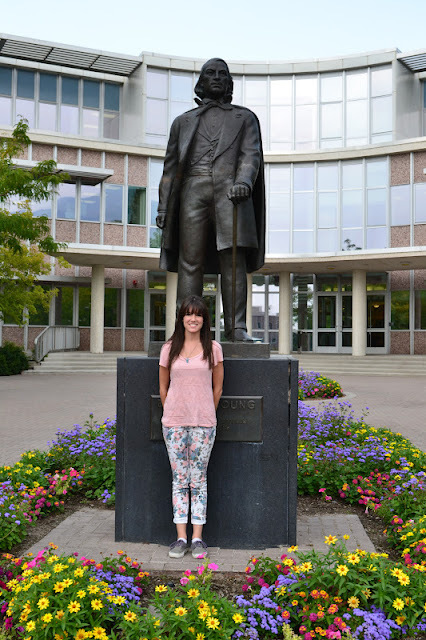 Then we started searching for Helaman Halls, her dorm, so that we could locate everything else in relation to that. Kind people who saw me photographing her, would stop and offer to take a picture of the two of us together. And we found it! Here is the Cannon Center, the main hub of Helaman Halls, where the cafeteria is located, another smaller Creamery, and study rooms, rec rooms, etc. She'll be spending a lot of time here. And here is her hall! 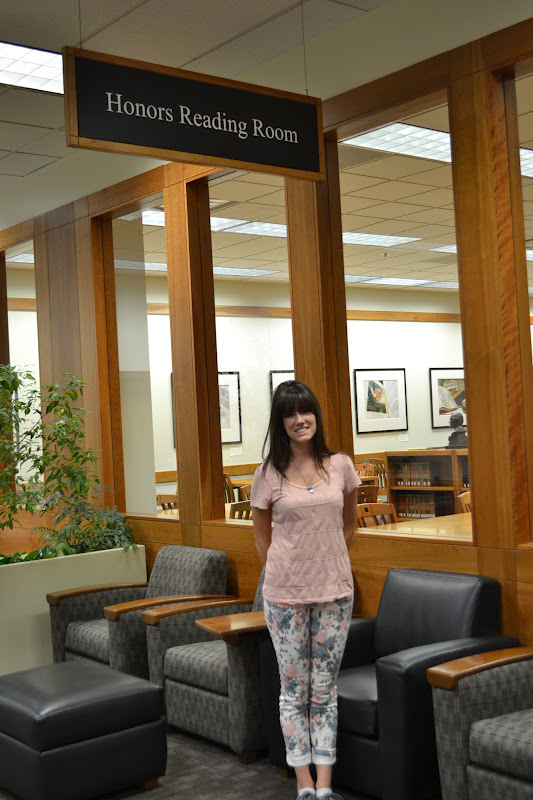 Her new home-away-from-home will be here, in Stover Hall. As of Saturday evening, she is now officially moved in. Here we are walking from Stover Hall, back toward the Cannon Center. I love this campus, can I just tell you that? I love the feeling there. I'm so happy that my daughter gets to be there, and I wish I could be there studying too! Now, back on the main campus, this is the atrium of the library, which extends very far to the right of this photograph. This part is new since I was last here. And the library also goes under ground to the left of this photograph and those smaller bluish glass structures there are the skylights to that portion of the library. The library is huge. We went to the Bookstore and printed off her booklist and I showed her how to locate her textbooks. She's already done all that now, and is ready to go. At 5pm, Jyssica, a friend from our ward, who is just about ready to graduate from BYU, met us on campus for a more informed tour. It was so nice to see her face, and comforting to Lyndsay to have a friend and see how fondly she talks of her experience here over the last years. We got Lyndsay's fall schedule, and Jyssica walked us to each of the classes so we could see right where they are. Fortunately, Lyndsay's schedule is pretty compact and she doesn't have miles to go between classes. It's going to work out beautifully for her. And she won't feel quite so lost on the first day. I took pictures of Lyndsay outside of her classrooms, kind of as a joke, but also because I like to have a picture in my mind of where she is and imagine her in class, learning so much. This is outside of her Biology classroom. 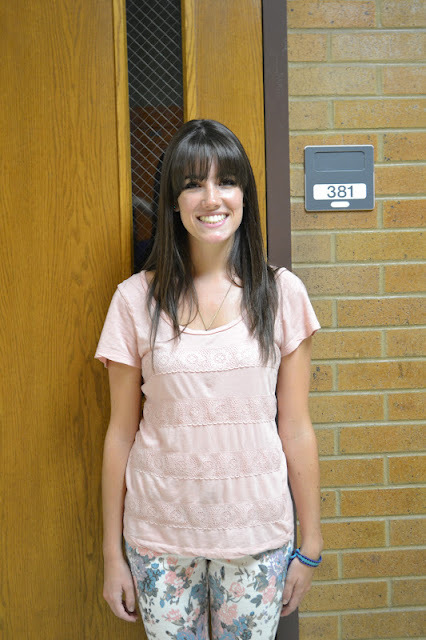 And here she is in her New Testament class, which will be her first class of Fall semester. Currently, this room is getting new seats. The Testing Center is a new concept to me, but it sure is a beautiful building. Tests don't happen in class during normal class time, but rather class goes on as normal and you are expected to go to the testing center during an assigned window of time and take exams on your own time. This is the Maeser building, where a lot of the Honors classes are held. This is actually where Lyndsay's Late Summer Honors Program class was held, so she's spent a lot of time here over the last week. Jyssica was a huge help to us. She answered our questions, and I know Lyns has already texted her with other questions that have come up. I'm so happy for Jyss, who has grown up so beautifully, and matured into a lovely young woman. And she found herself a very charming husband while here! After our tour, we went to (my favorite!) Cafe Rio for dinner. 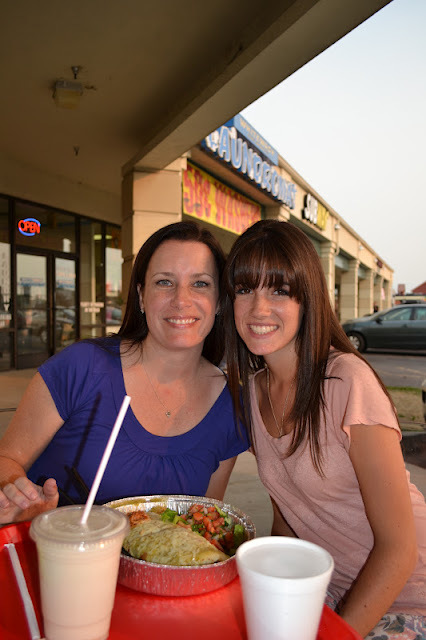 Lyns and I shared our favorite Pork Barbacoa Burrito. So super yummy. And then we went back to Kelli's for the night, and goofed around with her for a bit. Also, some Face Time with Aiden and Conor back home, who had finished their second day of school. This was my last night with Lyns. In the morning she would move onto campus and begin her LSH class. The Maeser Building! One of my favorite places on earth. I love to think of Lyndsay sitting in one of the same seats in which I sat all those years ago.